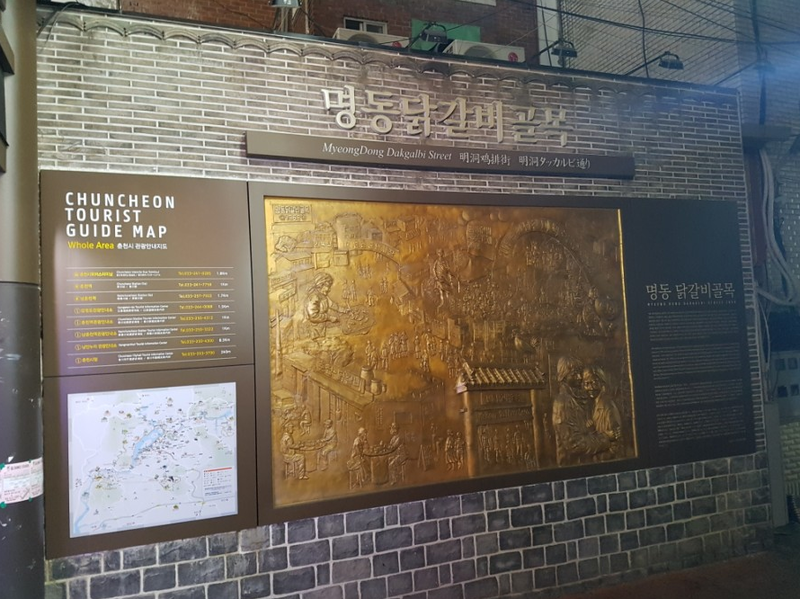 Take a look down Chuncheon’s most famous side street and you will find out what the area’s most popular food is. 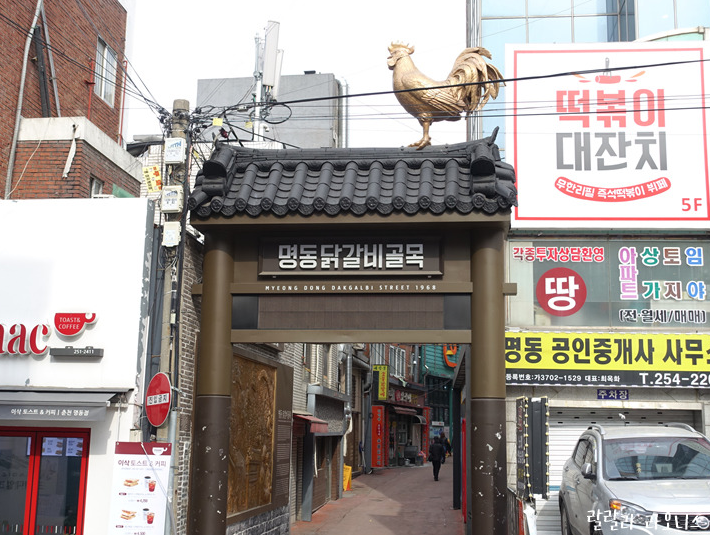 The name of the food is dakgalbi, spicy stir-fried chicken with vegetables. The other famous food of this region is makguksu, cold buckwheat noodles. This side street is Chuncheon’s most famous shopping street. 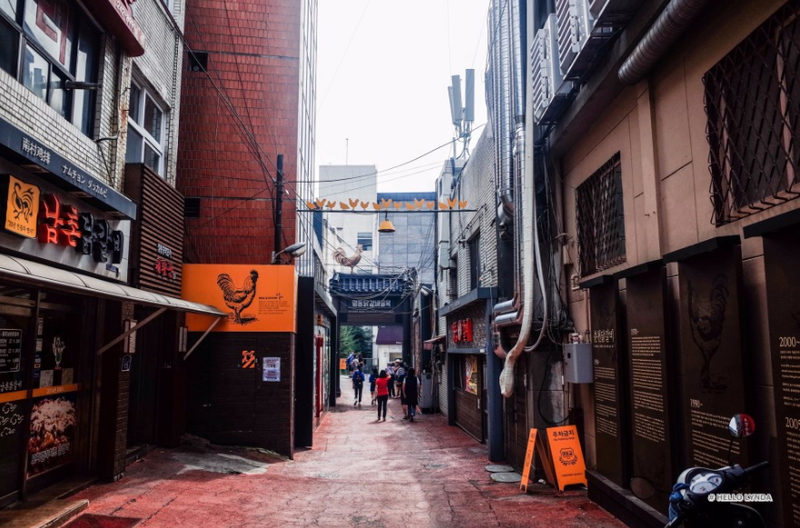 Locals refer to this street as the Myeong-dong of Chuncheon. Dakgalbi is prepared by marinating chopped chicken in spicy red pepper paste with peppery seasoning for about one day. Cabbage, green onions, sweet potatoes, and cylinder shaped rice cakes are then added and the ingredients are all placed in a large cast iron pan. The mixture is then typically stir-fried at the table. These days many people prefer the boneless option. Dakgalbi can be enjoyed on its own or wrapped in lettuce leaves for a fresh, crunchy taste. 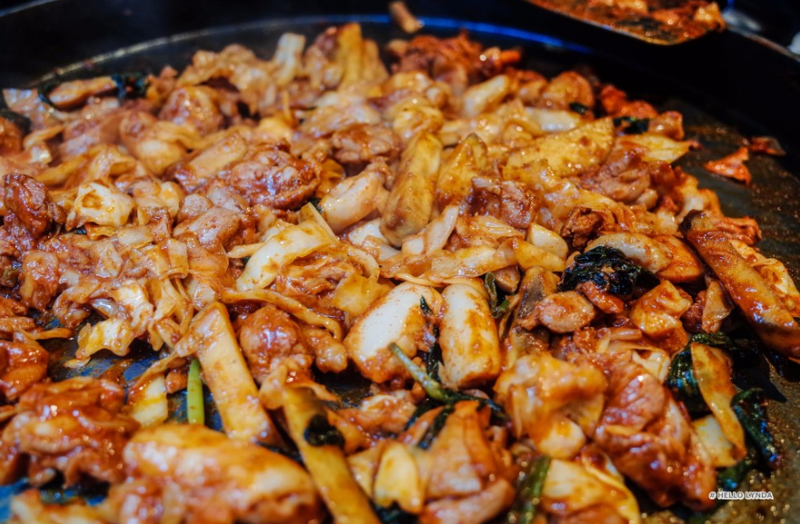 After most of the Dakgalbi has been eaten, rice is then stir-fried with the remaining sauce in the pan. This dish is ordered according to the number of people eating. Large quantities are usually given, so if you go with three people it is recommended to order Dakgalbi for two. For years, the Chuncheon region has been well known for its abundant poultry farms. 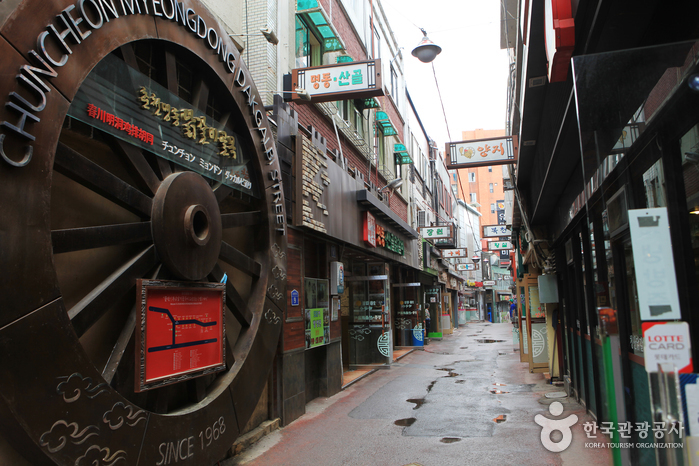 The famous shopping street in Chuncheon started out with only 2~3 dakgalbi restaurants. Now there are currently around 25. Due to the close proximity of the restaurants, the prices are almost identical. – Across from Chuncheon Intercity Bus Terminal, take city bus No. 7, 9, 64, or 64-2 and get off at Chuncheon’s Myeong-dong (10 min ride). – In front of Chuncheon Station, take city bus No. 63 and get off at Chuncheon’s Myeong-dong (about 10 min ride). – From Namchuncheon Station, take city bus No. 1, 32, 32-1, 35, or 67 and get off at Chuncheon’s Myeong-dong (15 min ride). – Takes 5 min from Chuncheon Intercity Bus Terminal. – Takes 5 min from Chuncheon Station. – Takes 10 min from Namchuncheon Station. This entry was posted in FOOD, Spot and tagged Chuncheon, Dakgalbi, foods, Korea, Korea trip, Korean, Korean foods, southkorea, ‪‎travel, ‪‎traveling‬, traveller, trip. Korea Christmas Fair from this week!